DonJoy's Velocity Ankle Brace, available in three different support levels, is the most useful brace for men and women at risk for injury-prone ankles. These braces are also ideal for those who have already experienced an ankle injury and are on the mend, and especially for those involved in athletics or high-impact activities who want to be proactive in preventing potential injuries. These Velocity Ankle Braces are so popular because they're not only functional but also very comfortable to wear. They feature a plastic shell that's both lightweight and heat moldable, giving each user a semi-customizable fit. The semi-rigid plastic that makes up the foot plate and lateral uprights provides protection against impact, such as being kicked during sports like soccer, football or rugby. Light Support (LS) is the standard configuration capable of providing the foundation required for prevention of ankle injury and treatment for those recovering from previous injuries. This is a bilaterally hinged brace with correct anatomical design that allows for unrestricted foot movement while guarding against unnatural ankle rotation that's the cause of most ankle sprains. Compression of the ankle to prevent swelling is provided by special R3 (Rapid, Rigid, Ratcheting) Technology™ incorporated into the calf cuff. 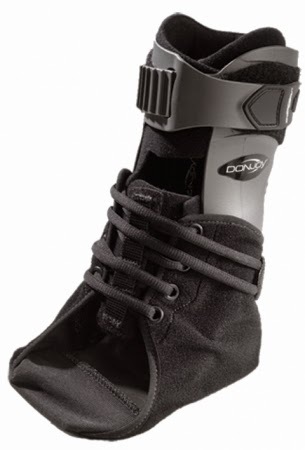 Lightweight and low profile, this brace is designed to comfortably fit into the user's shoe. It can also be trimmed to accommodate the use of orthotics, if necessary. The Medium Support (MS) Velocity Ankle Brace starts with the basic LS Brace and adds a soft, speed wrap that creates additional compression to the medial and lateral malleolus bones, which are the bony protrusions coming out of the sides of each ankle. This helps control inflammation and provides more support for those needing it, especially those recovering from past ankle injury. The Extra Support (ES) Velocity Ankle Brace takes the MS model and adds one additional speed wrap with laces for compression around the foot. The ES is the most popular choice of Velocity braces and is ideal for those suffering from chronic ankle problems, those rehabilitating from a past injury, and for athletes engaging in any type of sports activity where cutting or pivoting maneuvers are common. DonJoy Velocity Braces are appropriate for use by either men or women and come in black or white. They're available in three sizes (S-M-L), in two calf sizes (standard and wide), and can be ordered for either the left or right foot.